Whether you’re moving in or moving out, Junk Removal of STL can help. We work with tenants, homeowners and landlords. Our residential clean out services are bar none. The tenant just moved out. Well, you could call it that but she left behind garbage bags full of clothes, a dirty old couch and other personal belongings. You’ve got to get this unit ready to show to potential tenants. The longer this property sits on the market, the more of a loss you have on your P&L statement. Contact us when you are in need of residential clean out assistance. You live 4.5 hours away from your mom. Every major holiday and important event you make the drive to see her and spend some time. Each time you arrive, you are both perplexed and frustrated with the amount of stuff she’s accumulated. Old newspapers, magazines and documents litter the entire house. There are 3 T.V.s in the living room and only one of them works. During the last visit you couldn’t help but notice two couches stacked on top of each other. First realize that this is a psychological illness. 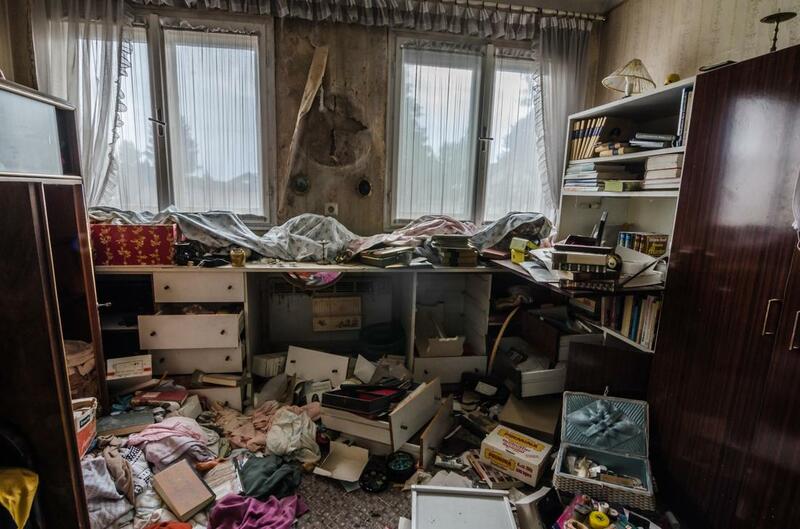 Second, we can help clear a hoarder’s space of clutter, trash and debris swiftly and without incident. A sense of pride washes over you as you’re handed the keys to your new salon. You’ve worked hard to get where you are today. House calls, unruly kids and cheap clients. This will be your first salon but not your last - it’s only the beginning. The neighborhood is gentrifying and there’s dedicated parking. Where others see a mess, you see potential. You’ll have to put in a lot of elbow grease but you’ve already got the help of your mom and boyfriend. But first you’ll have to clear out the boxes, bags and obsolete equipment left behind by the previous tenants. You don’t have to tackle everything on your own. Allow Junk Removal of STL to help you get your place ready for painting and cleaning with a thorough clean out. Our professional cleaners are versed in cleaning single family dwellings and multi-family homes. We clean walk-ups and apartments with elevators. Our staff touches every area of your home from the bathroom to the kitchen and dining room. Whatever you’d like us to remove is just one request away. Some of our repeat clients include real estate agents and multi-unit housing property managers. Real estate professionals frequently contact us to help them prepare a property for showing. Some agents have a roster full of foreclosures and abandoned properties that they’d like to sell. If this describes your situation, we would love to help. You don’t have to lift a finger. With our help you can run your real estate business without hiccups. We can get your property renter and buyer ready. Just let us know when, where and how much junk needs to be removed. Allow us to clean out your attic or basement. There are decades of clothes, appliances and old toys taking up space. With a clean attic or basement, you can transform it into a music room, extra bedroom or a place to sew and paint. Studies have shown that humans are more productive and think clearly in clean and uncluttered spaces. Isn’t it time you took the bull by the horns?